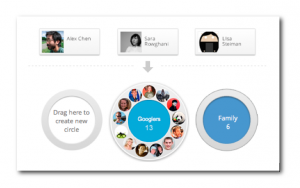 So the basic idea of Google circles is to allow you to create groups of people with who you can share all your latest news and views. Rather than sharing all your thoughts with everyone you can create separate groups or ‘circles’ of friends to share your news with. So the Saturday night antics you would rather not share with your work colleagues can be shared with only your closest friends. Whether this will take off like a rocket ship or sink like Google Wave remains to be seen. Let us know your thoughts.